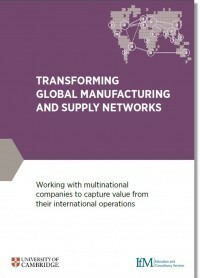 Designing and operating effective global networks is a fundamental source of competitive advantage for manufacturers. As networks have become increasingly complex and fragmented, it is more important than ever that international manufacturers are able to ‘make the right things in the right places’, have agile and resilient supply chains, and the right people and processes to run them. In recent years many companies have undergone rapid global expansion in order to access new markets and cheaper resources. At the same time, firms within supply chains have had to become more specialised in order to master increasingly complex technologies. And these specialised firms tend to be located all round the world. Optimising such complex networks so that they deliver the manufacturer’s strategic aims is challenging, particularly as each network partner has its own goals and business models. remain resilient in the face of an increasingly unpredictable external environment. "We are one of the world’s largest manufacturers, with sales approaching $50bn, and the main reason for starting this process was to secure the long-term optimisation of our production network. Over time the ‘burning platform’ has changed but the process remained the same, allowing us to constantly update the vision as conditions evolve. Since 2008 this approach has been used in all business divisions and services to guide our annual, multi-billion dollar capital spend through co-ordinated investments across the vertically integrated company." We have worked with more than fifty leading companies on network projects and have developed a set of structured approaches which support organisations through strategic and operational change. We can work with companies to address specific challenges or opportunities, or we can take a ‘whole system’ approach to achieve maximum competitive advantage from network optimisation. We also provide executive and professional development to improve companies’ network capabilities.